On the 12th December I was sitting in the Apollo Theatre waiting for the performance of the Curious Incident of the Dog in the Night Time to commence. My friend had kindly bought me tickets for my Birthday and I was very intrigued this fascinating book would be interpreted on the stage. Miss Myers: A lady at serious risk of getting sensible! I then felt momentarily depressed, what with it being my Birthday, at having such a profoundly sensible thought; the like of which would certainly not have occurred to me 10 years ago. I was not in the doldrums for long however, as the play started, utterly capturing my attention. But more of that in a moment…. A week later, on the 19th December, I was leaving a dinner when I received a text message from a friend, who knew of my intention to see the Curious Incident at around that time, saying she hoped I wasn’t at the Apollo Theatre that evening as the ceiling had fallen in! Suddenly my concerns regarding health and safety at the seemed most pertinent, as opposed to the neuroses of an aging mind, seeing as exactly a week a go I had been sitting in the very stalls which received the brunt of the debris! However, collapsing ceilings aside, it is well worth going to see the Curious Incident of the Dog in the Night Time, once the show is up and running again (from 24th June and the Guilgud Theatre). 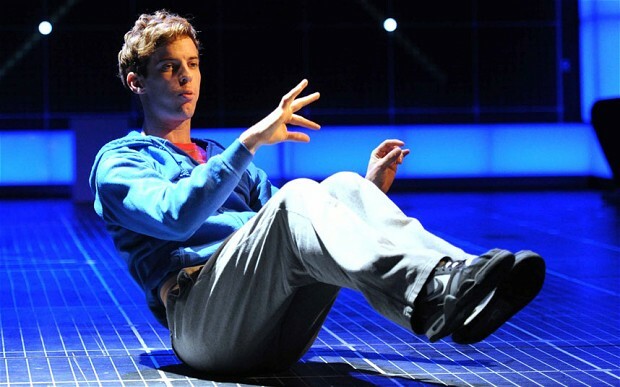 Luke Treadaway’s performance as Christopher, a 15-year-old boy with Asperagers syndrome, was hilarious, moving, and uncomfortably raw in turn and at no time anything other that 100% convincing. Whilst the staging creatively externalized the workings of Christopher’s mind, making particularly visceral the information overload of a tube station and the calming logic of his numeric inner world. The narrative was swift and engaging, encompassing a murder mystery along with the messiness of adult relationships all from the unique and brutally clear perspective of a boy who cannot lie. All in all, worth risking a run in with some falling plaster! This entry was posted in Uncategorized on January 13, 2014 by Miss Myers.